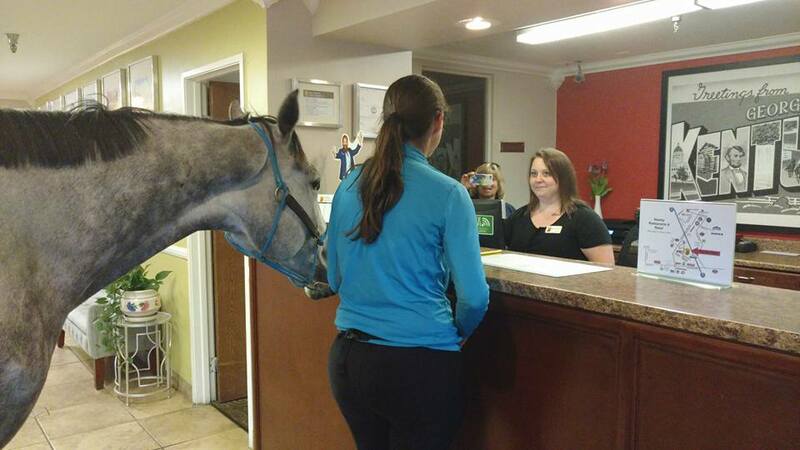 A video of horse trainer Lindsey Partridge bringing her horse into the reception area of the Georgetown, Ky Super 8 Motel, and later into her room, went viral last week, but management of the hotel are not happy. Hotel management says that Partridge, who operates Harmony Horsemanship in Pontypool, Ontario, Canada and was in town to compete in the Retired Racehorse Project's Thoroughbred Makeover, did not ask for permission to shoot the video. Further, they say the entire ordeal was against their policy and that Partridge had no right to shoot the videos and post them online for promotional purposes without their consent. Partridge, who conceded that she indeed did not request permission to post the videos, said the entire scenario played out “in less than a minute,” stating that as she was checking in she was told they allowed pets and thought it presented the perfect opportunity to create a light-hearted video for her training business's Facebook page, which has more than 10,000 followers. Read more and watch the video at WLEX. This entry was posted in Hoof Care, NL List and tagged Georgetown, Harmony Horsemanship, Kentucky, Lindsey Partridge, retired racehorse project, Super 8, WLEX by Paulick Report Staff. Bookmark the permalink.